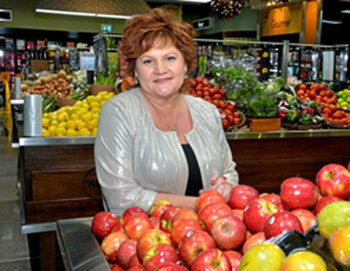 Roz White, co-owner of White's IGA and four IGA's across Queensland, has been announced as the latest businesswoman to be inducted into the prestigious IGA Hall of Fame. IGA has been inducting individuals into the coveted Dr. Thomas S. Haggai IGA Hall of Fame Award since 2001. Named after the Chairman of IGA Inc., the honour recognises outstanding achievements and contribution to the Australian independent retail grocery industry. Roz's success in retail and business also includes her numerous contributions to the local communities. Her most recent campaign has been rolling out a plastic bag reduction policy across her Queensland IGA stores. The initiative was rolled out across the four IGA stores with the aim of reducing plastic bag consumption by 50 per cent over the next 12 months. To encourage the local community to take advantage of the initiative, members of Whites IGA rewards program now receive 10 loyalty points per shop when using reusable bags. Speaking about her induction, Roz White said, 'I am truly delighted, overwhelmed and honoured to be recognised for my contribution to the industry – it is truly wonderful. 'Strong family values were instilled in me from an early age, working on my parent's farm and today I remain hugely passionate and dedicated to supporting our community. As an independent retailer, I am fortunate to be involved with many aspects of our community which allows White's IGA to give back to many local groups and charities. I believe this has been an integral part of the success for White's IGA," Roz continued. The presentation was made to Roz White by Roz's husband and co-owner Michael White, along with Mark Batenic, CEO IGA International, Ian Ashcroft, Chair of IGA National Retailer Council and Steven Cain, Metcash CEO of Supermarkets and Convenience. 'Roz has done an incredible job contributing to the Australian independent retail grocery industry and this honour is testament to her excellence on so many levels. Roz is a passionate leader of the White's IGA stores on the Sunshine Coast; promoting their -Locovore' philosophy, the stores source and stock 35 per cent of store purchases from local growers, producers and independent suppliers, as well as being strong local supporters of many community groups." Steven Cain said, speaking at the event. Question: What do you love about IGA, as a company? Roz White: IGA stores are independently family owned enterprise with a genuine focus on community. The ethos of community has been embedded within the IGA brand since its inception. IGA offers consumers a genuine shopping alternative in an intensely competitive market; with a focus on shopper experience and diversity sourced through a local supply chain and a strong support for Australian brands. I love the focus and attention IGA gives to local producers. Whites IGA stores are based on the Sunshine Coast of Queensland and we engage closely with a large network of local suppliers which has seen our four stores implement a unique -Locovore' culture which is now central to how we operate. We're so fortunate in Australia that we have an abundance of great produce to choose from. Meeting our local suppliers and working in collaboration to support their unique, artisan style products. We stock a range of local Queensland producers including Beeman Honey, Maleny Cuisine, Gourmet Afrika condiments, dressings from Pomodoras on Obi as well as fresh and local produce, small goods, meat, and dairy goods. We even introduced a line of camel's milk from Q Camel. Question: What originally inspired you to open your first IGA? Roz White: I grew up on my family farm where strong family values were instilled in me from a very early age. It was through my husband that he introduced me to retailing when we bought our first supermarket and since then, I've been passionate about supporting the community around me. We had the opportunity to buy an IGA supermarket in Bli Bli and with the fantastic IGA Community Chest program we are able to connect in such a positive way with the local community. Through IGA Community Chest (and other programs) IGA nationally has donated over $80 million. This program enables each retailer to give back to local groups in the community – sporting, school or charity groups. Those values align with IGA's and the rest is history as they say! Question: Can you tell us a little bit about your IGA stores? Roz White: Our family business is called White's IGA and we currently have four IGA stores on the Sunshine Coast at Mooloolah, Mt Coolum and Peregian Beach and Supa IGA Bli Bli. We are widely recognised on the Sunshine Coast for working with local producers, suppliers and growers through our unique -Locovore' culture. This local food movement has launched numerous new and emerging product lines to market and offers our customers an exciting shopping experience. We are passionate about independent retailing and helping to sustain the local economic ecosystem by supporting local farmers and producers, employing local staff and other local businesses such as Advanced Refrigeration Technology, a world class commercial refrigeration manufacturer based on the Sunshine Coast. Question: How does it feel to have been welcomed into the prestigious IGA Hall of Fame? Roz White: It's an absolute honour to be inducted. To have the respect of your peers and know that your work is being recognised is great. As a female in our industry I want to highlight the opportunities and the career path open. I have participated in national and state industry representation on behalf of our retail network for several years across a range of issues such as training, compliance, leadership and advocacy. My work and skills are diverse from working with my fellow retailers to advocating governments to ensure Independent retailing has a voice at the decision making table and to ensure we provide our shoppers with genuine choice and competition in the grocery sector. Question: What is your plastic bag policy? Roz White: I am so proud of my team and our local community for implementing our policy to reduce plastic bags consumption in Australia. We launched the White's IGA #SavetheBagSaveOurPlanet plastic bag reduction campaign to coincide with International Plastic Bag Free Day on Monday 3 July 2017. We rolled out the initiative across our four IGA stores with the aim of reducing plastic bag consumption. All IGA retailers nationally have committed to being single-use lightweight plastic shopping bags free. Many IGA retailers across Australia already have implemented this in store, along with a range of alternatives such as cardboard boxes, Boomerang bags and reusable bags. IGA retailers have committed to a phased approach that will fully in place across IGA network completed by 30 June 2018. Question: Can you talk about what motivated your plastic bag policy? Roz White: We live in a beautiful part of the world and and enjoy being active members in the local community. Environmental sustainability is always thought of in our stores. We take our responsibility seriously to seek to reduce our carbon footprint. Our customers have heartily embraced the waste reduction program and low energy initiatives we have adopted. As a big part of each community we serve, we felt it was our responsibility to lead on reducing single-use plastic bags which also resulted in the community getting involved such as Sea Life offering rewards to our customers who support this program. Question: What is the Locovore philosophy? Roz White: -Locovore' is a local food movement and culture, unique to White's IGA which supports local producers, suppliers and other local families. Joining the -Locavores' is easy with the introduction of an exclusive locavore symbol adopted throughout our stores so our customers can quickly identify locally sourced, produced and grown products. Being a locavore means food is most likely fresher, it has travelled the least amount of miles and creates vibrant and sustainable communities. Our locavore philosophy fits with the White's culture of creating sustainable communities with purpose. Our stores source and stock 35 per cent of store purchases from local growers, producers and independent suppliers. A store such as IGA can't survive without the support of the local community and we're proud to support those who support us. Question: Why is it especially important in Queensland to support local growers, producers and independent suppliers? 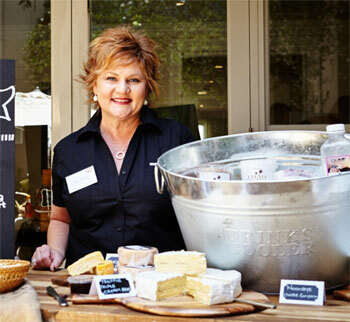 Roz White: Queensland has a thriving food scene and White's IGA stores are pleased to capture the opportunity to offer our customers a diverse range of specialty goods and fresher than fresh produce. In my experience shoppers want variety and choice. Consumers want local produce and our IGA stores have responded to this demand to ensure we provide the best quality and freshest produce from local suppliers. Question: What advice do you have for women looking to begin their own business? Roz White: Make it your passion and back your ideas with solid strategy. Keep your end goal clear and be prepared to walk through doors of opportunity even if you can't clearly see the road ahead. Good ideas will likely fail in business without a solid foundation to support them. Build a solid base so your ideas can flourish. Involve yourself in your chosen industry at every possible level. Information and knowledge is power and will help you to formulate good business decisions. A career in retail is challenging and dynamic and everything you do involves people. Surround yourself with good people all focused on that number one common goal – keeping your customers at front of mind - always and ever. Roz White: My weeks vary dramatically – every day is a new day with no typical day as such but that is the nature of retailing and our industry. That dynamism is what I thrive on. I touch base with my teams, create and implement strategies, troubleshoot, coach and provide direction to my leadership team. I connect with the community at all levels – with our customers, suppliers, trading partners and business colleagues. I love mentoring new and emerging business entrepreneurs, students at the local university and my fellow retailers. I attend meetings for the various boards, both industry and charity and advocate on on key matters integral to ensuring long term sustainable outcomes for Independent retailers across the country.